Upon the death of their father, the Goethem sisters are suddenly trying to survive on their mother’s wages as a laundress (or what remains after she spends half of her money on absinthe), and they are forced to go to work. Antoinette gets her sisters Marie and Charlotte into the Paris Opera, where they will train to be dancers, a grueling and demanding task. Antoinette, herself, finds work in the play, L’Assommoir, and falls in love with a young man who will soon threaten the bonds of the entire family. While dancing, Marie catches the interest of the artist, Edgar Degas, and becomes the model for his famous sculpture, Little Dancer Aged Fourteen…And in the process, inadvertently catches the interest of an older gentleman with less than honorable intentions. 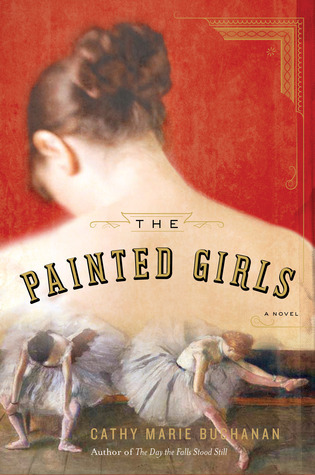 The Painted Girls, by Cathy Marie Buchanan, is about everything a woman had to do to survive in Paris in the late 1800s. Life was not parlors and needlework for ladies of the Parisian working class, and even less glamorous for young ballet dancers than you would ever imagine. This novel is dark at times, heartbreaking time and again, and the reader just wants the girls to finally overcome it all and find peace and protection from the scary world in which they live. The novel has a satisfying conclusion, but don’t be surprised if you find yourself reaching for the Kleenex box or craving chocolate (or both) while you read this one. This is so lovely to come upon. Thank you for the book love! The Painted Girls was one of a kind! Very refreshing and moving. I’ve already had a few friends start reading the book- thanks for putting such quality reading out into the world!